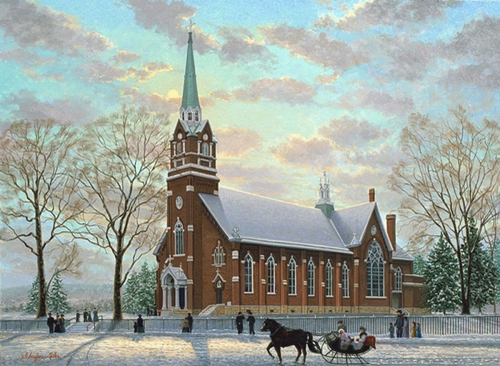 100th Year Anniversary painting of the S. S. Peter and Paul Catholic Church located in Independence, Wisconsin. Published from a 40"x30" original oil painting in the collection of the City of Independence. The picture depicts the proud heritage of the catholic chruch in Independence. Portraying a quiet winter day with a horse drawn sleigh to depict the charm of winter.